Welcome to the club! Used to see your name around in my e39 days. Very nice pick up! 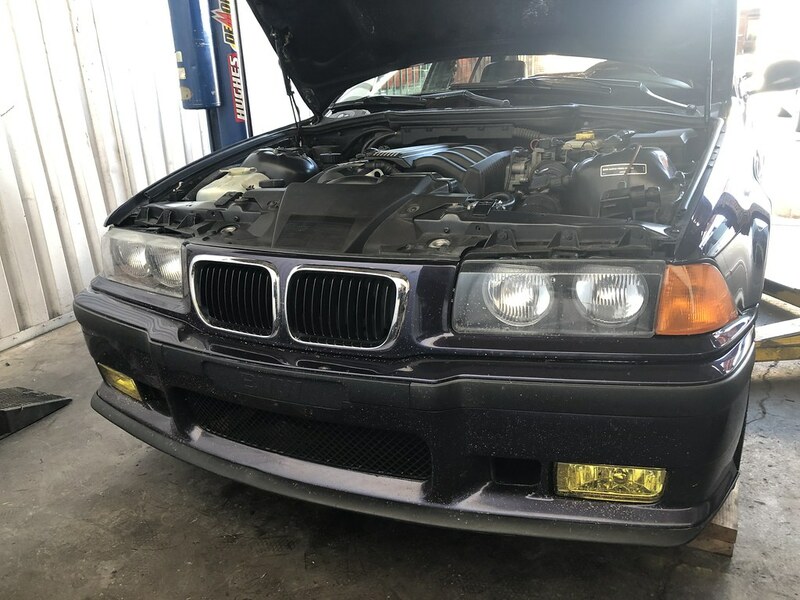 Just get rid of few things PO "added" - you know what they are (includes small upper radiator connector hose). Glad to see the car being rescued. That's pretty brave driving the car with potentially sketchy history that far but glad you made it! Car has plenty of potential! That color is really nice! Good luck with it. Thanks! Yeah, I'm all over the BMW world— E39's, E53's, E34's, BMW-engined Range Rovers, etc. I'm putting together a whole cooling system refresh at FCP Euro so that'll all get taken care of in one go. It's not the first time I've flown out to buy a car sight unseen, but certainly the furthest I've gone. I felt pretty confident since the car had spent most of its life in Texas and looked like it had been cared for at some point. Most of the stuff under the hood is still nice and stock, aside from the questionable "cold air" intake. I also was driving the car back with my good friend Graham who is an expert on E36's and Z3's, along with 50lbs of tools in my suitcase, along with a code reader, jump starter, and multimeter. I think us being so over-prepared is why the car did so well. We were pretty much ready to tackle any repair it might have needed, if it came down to it. 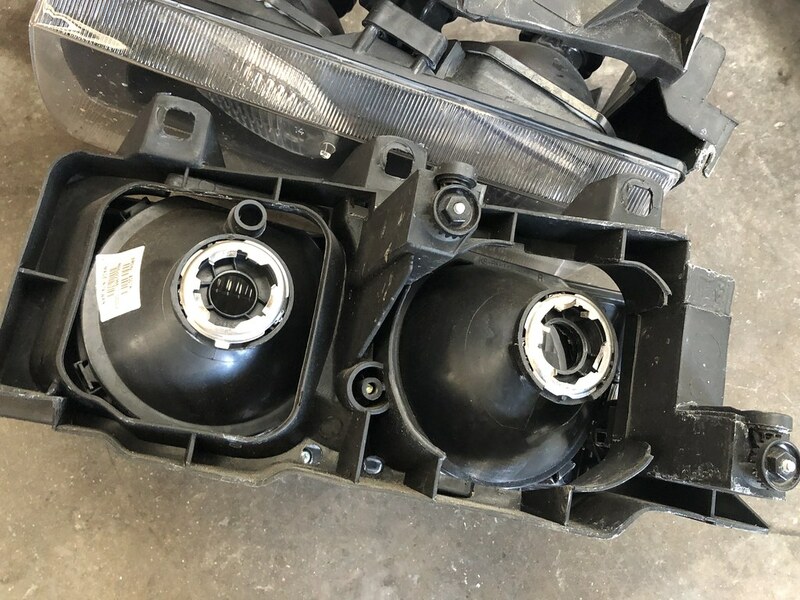 One thing I did forget to mention in my road trip story is that while we were at a friend's house in Missouri, we checked the coolant level the next morning and found it to be massively overfilled, which could have definitely been a disaster if the cooling system over-pressurized. We removed all the extra coolant with my friend's extraction pump, so now it's at the proper level and not putting any extra stress on the cooling system. Thanks! I'm really digging the color, I love finding cool color combos like this. My last daily driver was a 2000 BMW 540it wagon in Japan Rot (similar to Hellrot) which was super uncommon and cool as well. 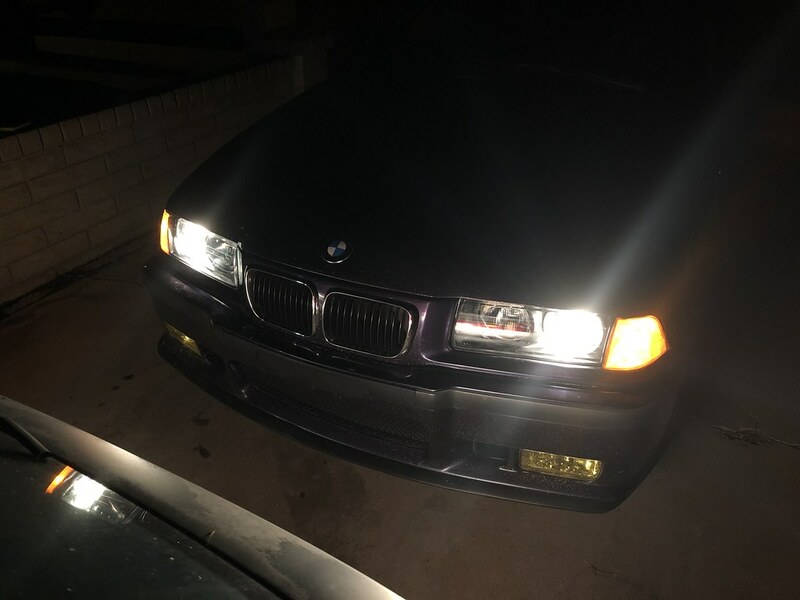 I had always wanted a Techno Violet E36 M3, but I only saw them in coupe form which I didn't want. 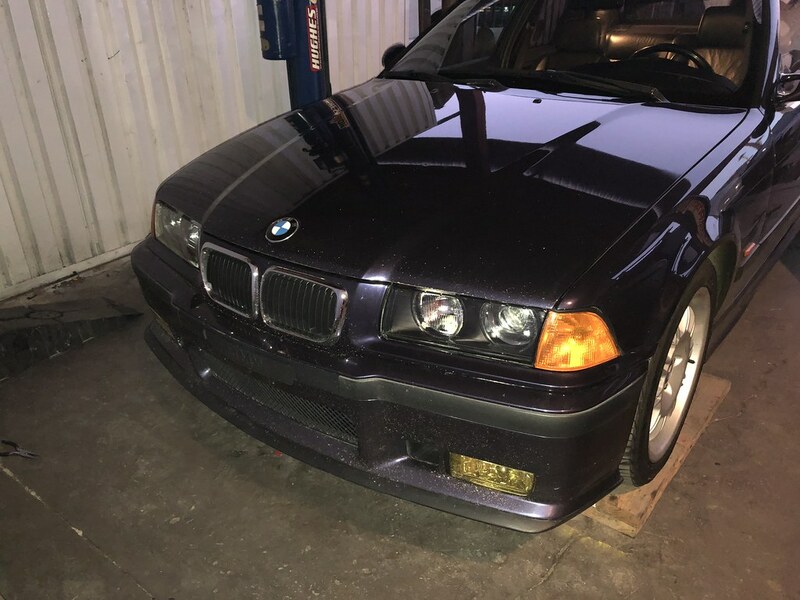 Plus a lot of the Techno Violet M3's kept having higher asking prices like a lot of the other desirable/rare colors (like Hellrot and Dakar), so when I saw this one for a very reasonable $3800, I just had to get it! Look forward to seeing more updates! I took it through emissions today and it passed with no problems, awesome! Later in the day, I threw it up on the lift at work. I forgot to take underbody pictures but aside from the tiniest bit of corrosion on the exhaust, it was completely rust-free! Not bad for a car that spent some time in Wisconsin. It was pretty dry underneath the engine too, which was a pleasant surprise compared to the leaky messes I usually buy. After that, I replaced the awful knockoff headlights with much nicer Depo units. The old units didn't sit right at all, couldn't be adjusted very much, and had absolutely dreadful light output. 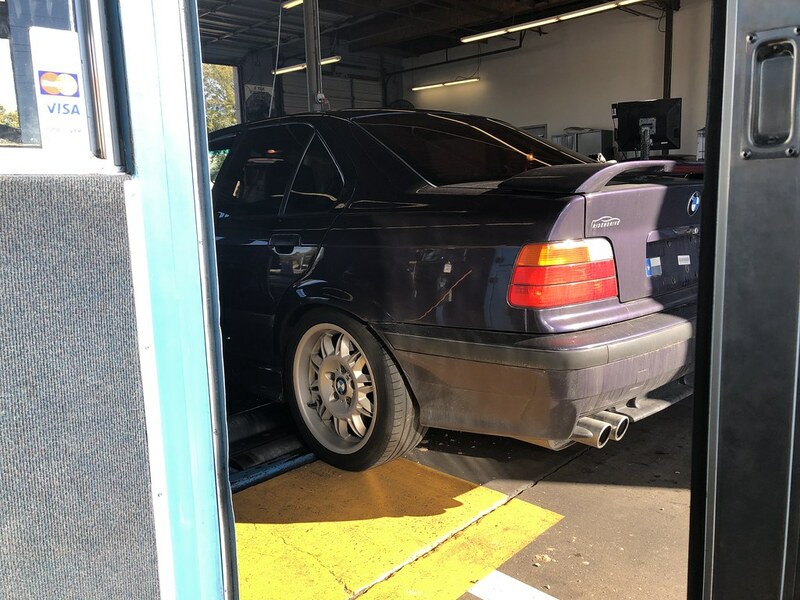 My E36-loving friend (and coworker) helped me with this, especially with the wiring. We used the harness adapter, but it required a bit of trial-and-error since the Depo headlights are seemingly wired at random, with no rhyme or reason. For the price, I'm not complaining at all though! I also installed a turn signal corner on the passenger side to replace the one that had randomly gone missing on the trip home. Huge thanks to my friend for having all these E36 parts just laying around. No more obnoxious fast-blink every time I turn right! We still need to do some more tweaking on the headlight positioning and aiming, but it's a huge improvement already, even with cheap H1 bulbs. It looks amazing, it's such a nice upgrade. Already getting better. Good start. 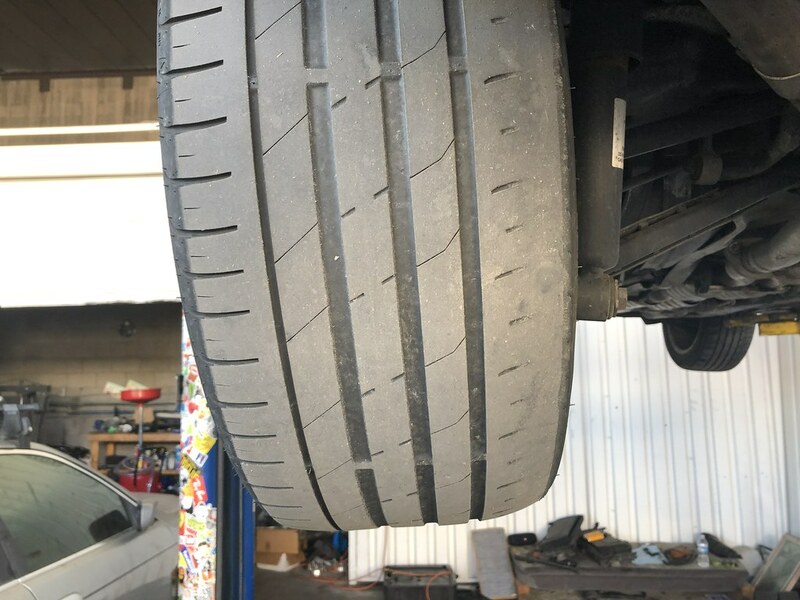 Get some tires on there ASAP! There seems to be been quite a few sedans pop up recently. Also one of my favourite colours. 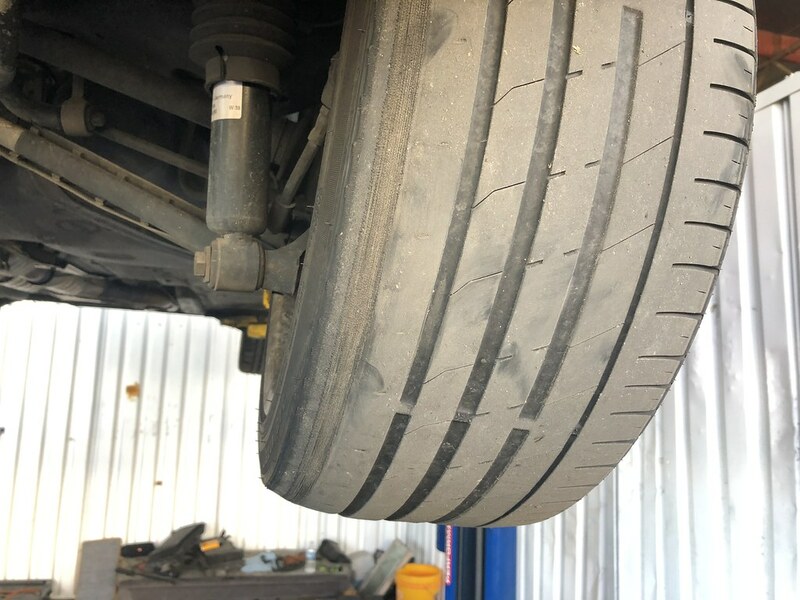 Tyres obviously need replacing but be sure to get an alignment too, that wear isn't normal. And it's odd to see that aux power cable cut, especially since you can still use the headunit... what type of amp is in there now? Perhaps the PO had an active sub connected to a stock amp but that doesn't sound like an ideal setup. Yeah, I plan on replacing the tires + some of the suspension components and then an alignment. It looks like the stock amp was never removed... the PO just ran an output from the head unit into a separate amp that powered the sub. That's the only explanation that I can think of, since all of the speakers work just fine. Right now there's a decent shake above 65mph, and it gets particularly bad after 85mph. The steering wheel has a noticeable shake to it after 70mph as well. I attribute that to a combination of bad tires + poor balancing + worn control arm bushings. There's also some clunking from the front and back at times. It's not the worst suspension I've driven, but I want it to be nice and tight. I'm pretty sure the shocks are tired as well— they look to be original. Eventually those will get replaced by BC coilovers, so that'll take care of the shocks/springs/shock mounts all at once. All times are GMT. The time now is 06:17:35 PM.